Bake for 10 to 12 minutes or until cookies are set and lightly browned. Remove from oven. 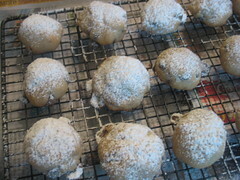 Sift powdered sugar over hot cookies on baking sheets. Cool on baking sheets for 10 minutes; remove to wire racks to cool completely. Sprinkle with additional powdered sugar if desired. Store in airtight containers.